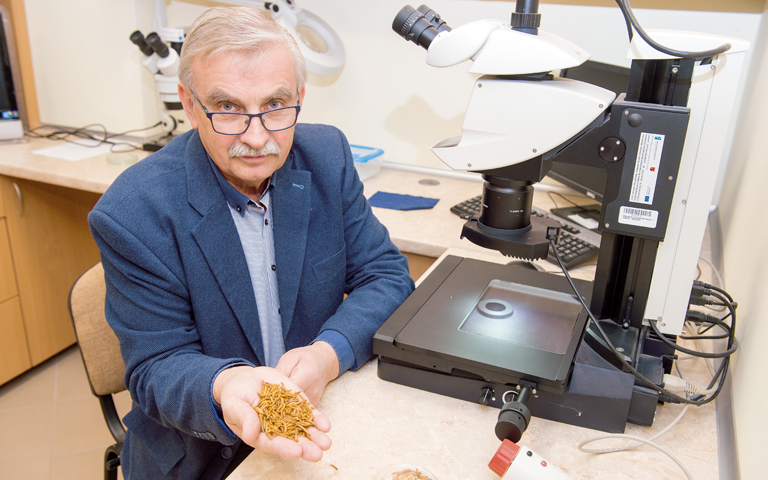 - Last year, you started implementation of the grant "Developing a strategy for using alternative sources of insect protein in animal nutrition, enabling the development of its production in Poland." Could you say something more about this research? - Presently, Poland imports annually approx. 2 million tonnes of genetically modified soybean meal intended for feed. The ban on the production and use of GM feed in animal nutrition has become a serious problem. This ban applies to all animals, regardless of the size of the farm. It is therefore necessary to develop a new strategy for substituting genetically modified protein with no-GMO protein of domestic origin. The regulations allow for the use of feed in aquaculture of the following species of insects: black fly, housefly, mealworm, alphitobius diaperinus, house cricket, banana cricket and Cuban cricket. Another EU programme involves a risk analysis of using insect protein in feeding other farm animals. Our task is to develop a strategy for the development of insect protein production in Poland. - Several scientific units are participating in the grant. What is the UWM’s role? - We will carry out nutritional tests. For the experiment, we will use broilers and two species of insects, which we will choose after a detailed analysis. Thereafter, we will determine the nutritional values of feed materials derived from these insects. In the third stage, there will be up to five departments from our university, involving about 30 people. After the tests on an industrial scale and the development of insect protein processing technology and principles in the field of production safety, including HACCP and conducting opinion polls on the use of insect protein in animal nutrition in Poland, a strategy for the development of insect protein production will be developed and disseminated - as an alternative to genetically modified soybean. - What benefits will Poland have from this strategy? - The result may be the development of a new form of economic activity for both farmers and feed plants. New jobs will be created, entrepreneurship will develop and the production of cheaper food and feed will increase. Breeding of insects intended for feed purposes can also be an opportunity for north-eastern Poland, especially for the Podlaskie, Mazowieckie and Lubelskie voivodships where African Swine Fever occurs. This alternative will contribute to maximising the potential of this area and the retraining of farmers from breeding pigs to breeding insects. - Is the situation on the Polish feed market so bad that it is necessary to look for substitutes? - In Poland, a limited amount of high-protein feed is produced that provides valuable components for the production of feed, especially industrial feed. Soybean meal is of major importance in the balance of the meal and it is all imported. It is estimated that 93-95% of soybean meal in international trade is meal made from GMO plants. There is a need to find an alternative to GMO, and both soybean meal imported from abroad and the use of meat and bone meal in animal nutrition are banned. Thus, there is a need to develop a production technology for insect species whose breeding and protein amino acid composition is optimal. Previous studies indicate that insect protein is a protein with an amino acid composition the closest to soybean protein and fish protein. The research project "Development of a strategy for the use of alternative sources of insect protein in animal nutrition enabling the development of its production in the territory of the Republic of Poland" is financed from the National Centre for Research and Development. Its cost is about PLN 5 million. It will be implemented from 1 November 2018 to 31 October 2021. The consortium is comprised of: The Ministry of Agriculture and Rural Development, the University of Warmia and Mazury in Olsztyn and the State Veterinary Institute - National Research Institute in Puławy.